“Thanks to the treason committed by Sadat at Camp David, the Palestinian State has not been able to exist, despite the UN treaties of November 1947, and Israel became a strong nuclear power, an ally of the United States and NATO. The US Military Industrial Complex supplied Israel with tens of billions of dollars every year as well as to the very Arab States that were submitted and being humiliated by Israel. The genie has escaped from the bottle and NATO doesn’t know how to control it. They are going to attempt to wrest the most benefits from the regrettable events in Libya. Nobody can know at this moment what is happening over there. All the figures and versions, even the most implausible ones, have been spread by the empire via the mass media, sowing chaos and disinformation. “…What would be the consequences in the midst of the food crisis? What Ban Ki-moon is really hoping is that Obama pronounces the last word. The president of the United States spoke this Wednesday afternoon and stated that the Secretary of State would be leaving for Europe in order to agree with their NATO allies on the measures to be taken. On his face once could note the opportunity to spar with John McCain, the far-right-wing Republican senator, pro-Israel Senator Joseph Lieberman from Connecticut and the leaders of the Tea Party, in order to ensure the Democratic Party demands. The empire’s mass media has prepared the terrain for action. 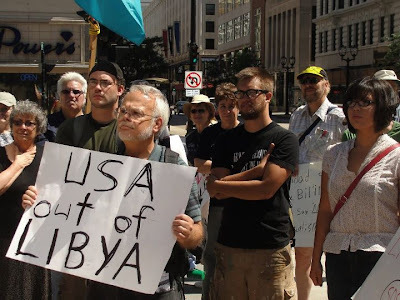 There would be nothing strange about a military intervention in Libya; besides, with that, Europe would be guaranteed almost two million barrels of light oil per day, unless before that events would put an end to the leadership or the life of Gaddafi. “Anyway, Obama’s role is rather complicated. What will the reaction of the Arab and Muslim world be if blood should flow in abundance in that country as a result of that exploit? Would NATO intervention in Libya stem the revolutionary tidal wave surging in Egypt? “Nobody in the world would ever agree with the deaths of defenceless civilians in Libya or anywhere else. And I wonder: will the US and NATO apply that principle on the defenceless civilians that the unmanned Yankee planes and the soldiers of that organization kill every day in Afghanistan and Pakistan? While I was meditating upon these events, the debate scheduled for yesterday, Tuesday, October 25th, began at the United Nations, on the “Necessity of ending the economic, commercial and financial embargo imposed by the United States of America against Cuba”, something that has been addressed by the immense majority of the member countries of that institution over the course of 20 years. This time, the numerous basic and just reasons – that for US administrations were nothing more than rhetorical exercises – made clear as never before the political and moral weakness of the most powerful empire that has existed, to whose oligarchic interests and insatiable lust for power and wealth all the inhabitants of the planet have been submitted, including the people of that very country. The United States tyrannizes and pillages the globalized world with its political, economic, technological and military might. That truth becomes ever more obvious after the honest and valiant debates that have been taking place in the last 20 years at the UN, with the support of the states that one presumes express the will of the immense majority of the planet’s inhabitants. Before Bruno’s address, many countries’ organizations expressed their points of view via one of their members. The first of these was Argentina on behalf of the Group of 77 and China; Egypt followed on behalf of the Non-Aligned Nations; Kenya on behalf of the African Union; Belize on behalf of CARICOM; Kazakhstan on behalf of the Islamic Cooperation Organization; and Uruguay on behalf of MERCOSUR. Besides these group-based expressions, China, a country with growing political and economic clout in the world, India and Indonesia firmly supported the Resolution through their ambassadors; among the three of them they represent 2.700 million inhabitants. The ambassadors of the Russian Federation, Belorussia, South Africa, Algeria, Venezuela and Mexico also spoke. Among the poorest countries of the Caribbean and Latin America, there were vibrating words of solidarity, such as the ones by the ambassador of Belize, who spoke on behalf of the Caribbean community, also the ambassador of Saint Vincent and the Grenadines, who spoke on behalf of his country and the one from Bolivia, whose arguments related to solidarity with our people, despite a blockade that is now lasting 50 years, will be an undying stimulus for our physicians, educators and scientists. Nicaragua spoke prior to the vote, to courageously explain why it would be voting against that treacherous measure. Also speaking earlier was the United States representative, to explain the unexplainable. I was sorry for him. It was the role they had given him. When the time for the vote arrived, two countries were absent: Libya and Sweden; three abstained: the Marshall Islands, Micronesia and Palau; two voted nay: the US and Israel. Adding up those who voted nay, abstained or were absent: the United States with 313 million inhabitants; Israel with 7.4 million; Sweden with 9.5 million; Libya with 6.5 million; Marshall Islands with 67.100; Micronesia, 106.800; Palau with 20.900, the total comes to 336 million 948 thousand, equivalent to 4.8% of the world’s population which this month is at 7 billion. Following voting, to explain their vote, Poland spoke on behalf of the European Union which, in spite of its close alliance with the United States and its forced participation in the blockade, is against that criminal measure. Afterwards, 17 countries spoke, to resolutely and decisively explain why they voted for the Resolution against the embargo. To be continued on Friday the 28th. Moneylender Review of Singapore is offering customer reviews of legal money lenders in Singapore. All providers listed here are licensed under Singapore Moneylenders Act, complying with regulations set forth by Registry of Moneylenders. By combining the reviews of all moneylenders in one place, it is easier for you to choose the best loan option. World democracy related to economic travel zone. Big source of issue in Nepal and India.